"Rockin & Rolling for over a decade"
Right Turn at 40 is a comprised of six talented and experienced lifelong musicians, using the gift of music as a means to bring people together to sing, dance, laugh, celebrate and enjoy. We bring your favorite Rock & Roll memories back to life with a large collection of hit cover songs from the past four decades, from artists that you know and love. It is with great pleasure that we announce Tim Silk to the Right Turn at 40 line up. 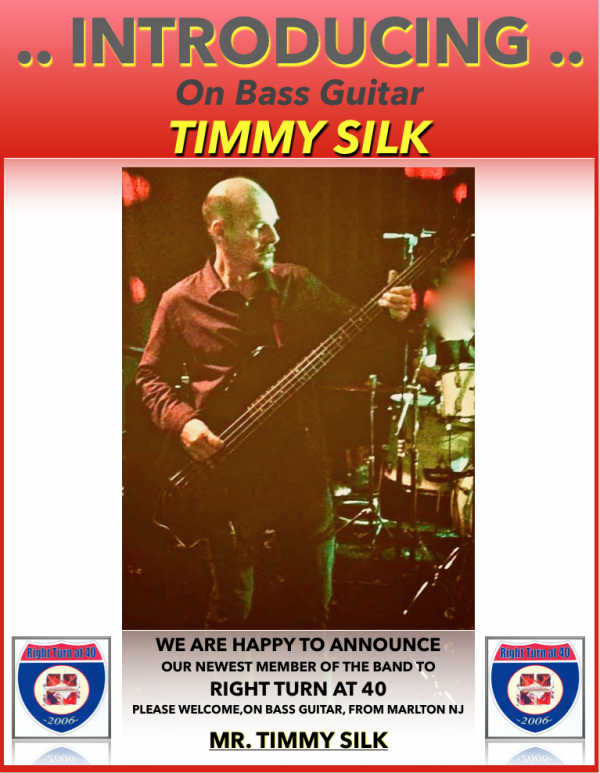 Timmy is an awesome and long time Bass Player who has been in several successful Classic Rock Bands. We're sure he will be a huge contributor to the RTAF sound and we are happy to welcome him to the craziness. First gig on deck, Trio Tavern this coming Saturday. Come on out give him a warm welcome. 40,100 views since Tuesday, 05 April 2011.